Rena Jones, with daughter Ca'Morria and son Kemorrion, still has nightmares about Kenmorrion's attempted abduction. (CNN) -- Three weeks ago, while recovering in the hospital after giving birth to a baby girl, Rena Jones was amped up and on guard. "I didn't sleep for a whole 72 hours, because I was nervous thinking somebody was going to come again to take my baby," Jones says. This time, Jones was being vigilant. 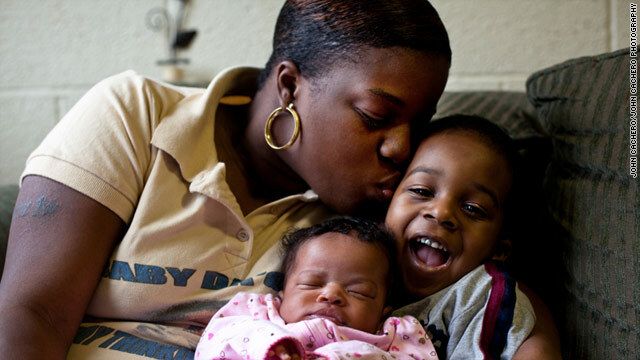 The last time she'd been to the hospital to give birth in 2007 her baby was stolen. "I still have nightmares about it. I still have dreams about it," she says. Jones remembers feeling tired in the moments just before the kidnapping. She called to have her two-day-old son Kemorrion returned to the nursery so she could sleep. She was drowsy from medication numbing the pain of her Cesarean section when a woman in nursing scrubs came to her bedside. "I thought she was a nurse," Jones says. Jones gave the woman her baby and started to doze off. Soon after, another woman in nursing scrubs entered to take Kemorrion to the nursery. "I said, 'I just gave ya'll the baby,'" Jones recalls. The security at Sentara Norfolk General Hospital in Norfolk, Virginia, quickly put the building on lockdown and searched for the kidnapper. Forty-five minutes into the search, Jones says, no one had found her baby. "I literally pulled my hair out. That's how scared I was. I got to shaking and screaming," she says. Kemorrion was eventually located under a waiting room chair, zipped inside a diaper bag with a blanket over him. His mom says he was lucky to be alive. "It was the grace of God he didn't die," Jones says. "When they unzipped the bag he was wiggling his little feet, smiling." The abductor had ditched the baby in an attempt to flee but was apprehended and sentenced to five years in prison. According to reports the woman had always wanted a baby and had lied to her family about being pregnant. Baby abductions from hospitals are extremely rare -- only 128 such cases since 1983, according to theNational Center for Missing and Exploited Children. This month, Carlina White was reunited with her family 23 years after she'd been abducted as a 19-day-old baby from a hospital in New York. "Although one case like this is too many, aggressive security and comprehensive protocols in place are better and ensure families are more secure than 23 years ago," says Marie Watteau, a spokeswoman for the American Hospital Association. If you've ever walked the floor of a maternity ward it's clear that security is intense: time-delayed door locks, controlled access panels, closed-circuit television monitoring, matching numbered ID bands for moms and their babies, electronic infant-bracelet alarms. Often nurses transport babies in bassinets and aren't allowed to move more than one baby at a time. Almost always these kinds of security measures thwart a would-be abductor, and they have helped reduce abductions. Last year, just one baby was abducted from a health care facility, in contrast to 1991 when 11 babies were kidnapped. The majority of babies in hospital abduction cases are located, but five cases have gone cold and the children are still missing. Even with such security measures, Rena Jones probably isn't alone in her fear that someone could still abduct a baby inside a hospital. You can make your baby less a target. Here is advice from abduction experts and others on how to guard against baby snatchers. Baby abductors often fit a profile you can watch out for, says John Rabun, who specializes on infant abduction cases at the National Center for Missing & Exploited Children. Abductors are women, mostly in their mid-20s to mid-30s, Rabun says, and they're familiar with childbirth, hospital routines and the layout of maternity wards. "She's been in the facility for hours and days on end," he says. "She knows just enough about birth and nomenclatures. So, she's dangerous." Abductors know how to throw around medical terms, and they're confident mimicking nurses. In many abductions, the abductor is even dressed in hospital scrubs. "I can't fault the moms because in the majority of these cases the person is coming in posing as a nurse," says Cathy Nahirny, who also specializes on infant abduction cases at the National Center for Missing & Exploited Children. "Don't take what's being presented to you at face value." That's precisely the mistake Jones regrets making when she handed Kemorrion over to the woman she believed was a nurse. Jones says that the woman had been on her hospital floor for three days and that she had Kemorrion's proof of birth and had even tried to give the baby medicine. "She would come to my room. She would fluff my pillows. She was really nice to me," Jones says. "She didn't even know me, but she was aiming for my baby." Most baby abductions in hospitals occur right in the mother's room. "The single most dangerous time is when mom goes to the bathroom," Rabun says. "When mom goes to the bathroom you don't leave Junior out there by himself. You take the baby with you." Put your baby in a bassinet and roll it into the bathroom with you. You can also put your family and friends on duty when you need to use the bathroom or take a nap. "If Grandma is there, baby's perfectly safe. Give the baby to Grandma," Rabun says. Rena Jones put her brother-in-law on duty when she was in the hospital three weeks ago. "Have a special family member to stay with you at that hospital," she says. If you don't have family with you, buzz the nursing staff to have your baby returned to the nursery instead of leaving your baby alone. And about those bassinets: that's how hospital workers should be transporting your baby. Anyone who tries to take your baby out of the room in their arms is probably at the very least breaking the hospital's rules, and may have a plan for your baby. You can also keep your baby's bassinet away from the door to lessen the risk of someone walking off with your baby. Before you make the mistake of handing your baby over to someone you shouldn't you need to check that person's hospital identification. "There are only precious few staff who are allowed by a hospital to take a baby to and from mom. Mom's gotta know that," Rabun says. This time around, Jones wasn't about to let anyone con her daughter Ca'Morria out of her arms. "I was cautious of everyone in there. I wanted to see everyone's tag," she says. "Look at every nurse that comes into your room. Make sure they show you their name tag. Make sure they have on their name tag. If they don't have on their name tag, call security." And don't put all your faith in your baby's own ID, the electronic tag hospitals often attach to babies after they are born. "While that technology is very beneficial and helpful, it will not 100% prevent an abduction," Nahirny says. Allison Pastor almost had her baby stolen from her at a hospital in Sanford, Florida, in 2008 when a woman posing as a nurse wanted to take the baby for a test. "The baby had just fallen asleep for a nap, and this lady walks in. She said, 'We gotta take the baby for a hearing and eye test. It's standard procedure. It'll be real quick, and I'll be right back." Pastor gave her newborn daughter, Aubriana, to the woman but quickly realized something wasn't right. "She started to turn around to leave, and I was like, 'Wait a minute. She had that test done last night,'" Pastor says. "She gave me back the baby and walked out of the room." It was a close call for Pastor and her daughter. The fake nurse went on to abduct a baby down the hall. She was caught on surveillance video and was captured by authorities. "[Aubriana] was so close to the one being abducted," Pastor says. Ask who authorized the test your baby needs and why your baby needs it. Make sure the answers make sense to you. You can also go with your baby and watch the test yourself. Hospitals may have tightened their security to prevent baby abductions, but that hasn't cured the crime. "It drove the crime outside of health care to the home and other places," Rabun says. In some cases, a baby abductor has gone into a hospital impersonating a nurse to make initial contact with a targeted mother, only to then wait and steal the mother's baby from her home after she's been discharged, often posing as a visiting nurse the mother met at the hospital. About this type of abductor, Rabun says the person may tell you, "I'm a nurse. I was on your floor...There's that fleeting moment, I've seen you before." It's unusual for a nurse or hospital worker to visit a discharged mother at home, Rabun says. When such visits are necessary, hospitals are advised to let you know about them ahead of time. Before you leave the hospital ask whether anyone on the staff will be visiting your home. Don't be too trusting, check for identification, and if you're at all suspicious, don't let them in your house. Bottom line, says Rabun, "Nobody loves your baby as much as you do, parent. So you gotta keep your eyeballs on them."